We all know that driving holds a certain amount of risk. And we also know that much of our beautiful Sunshine State consists of natural bodies of water. However, the combination of driving and the water present by roadways throughout Florida can be a terrible one. A 2011 report published by the National Highway Traffic Safety Administration found that on average, there were 384 traffic fatalities per year during the evaluated period in which accidental drowning was one of the causes of death. That report also indicated that 63 percent of vehicle drowning fatalities involved a rollover and 12 percent involved a collision with another vehicle. On the positive side, all accidental vehicle submersions do not end so grimly. The Tampa Bay Times recently reported that a 20-year-old woman became trapped after the vehicle she was driving early in the morning on New Years Day ran off the road and began to flood. Fortunately, the woman called 9-1-1 and authorities reached her in time for her to escape with only minor injuries. Authorities credited the young woman’s survival to her quick thinking of using Google Maps to pinpoint her location even as her cell phone battery was draining. In this kind of situation, being able to think quickly and reacting calmly can save your life. 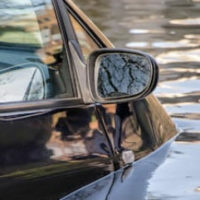 What Do I Do If My Vehicle Becomes Submerged? Try not to panic. Panicking can lead to over exertion which can tire you out and take valuable energy you need in this situation. Roll down your car window as quickly as possible to create an escape route. The more time that passes, the more likely that water pressure will prevent it from opening. Find an air pocket. If you cannot open a window, find the highest point of the submerged vehicle with the largest amount of air. If you cannot escape, call 9-1-1. Authorities will then head to you as quickly as possible. What Can I Do to Help Avoid an Accidental Vehicle Submersion? Can Anyone Be Held Responsible? Depending on the circumstances of your case, absolutely. As stated above, a whopping 12 percent of the fatalities in these situations involve a collision with another vehicle, and that statistic does not address the many more accidents resulting in less-than-fatal injuries. If another driver negligently causes a collision that leads to your vehicle exiting the road and becoming submerged, you can probably recover much-deserved compensation. An experienced automobile accident attorney can help you evaluate the facts of your claim and hold the responsible parties accountable. Allow Experienced Automobile Accident Attorneys to Help. If you or a loved one has been injured in an accidental vehicle submersion due to someone else’s negligence, we can help. The Tampa automobile accident attorneys at The Pendas Law Firm are experienced in helping people like you recover the compensation that you deserve. Contact us today to schedule a free initial consultation. The Pendas Law Firm also represents clients in the Fort Lauderdale, Miami, Orlando, Jacksonville, Daytona and Bradenton areas.